Optimize your PC�s graphics with the Asus Radeon R5 230 Graphics Card. With this systems DirectX 11 GPU-accelerated tessellation you are allowed more detailed geometry to be packed into a scene ; making it possible to render your characters in cinema-quality detail. Plus, with this great power comes great use, and this baby is prepared to maintain your card�s temperature. Its cooling features work silently but powerfully to ensure that your system is under no threat of overheating. And it also enables you to run your games at 1280 x 1024 resolution so that you can immerse yourself in the game you�re playing. It also supports Blu-ray 3D, so that you can enjoy some amazing quality from the comfort of your PC. And best of all, with its GPU tweak and tweak streaming tool you can keep track of your clocking speeds, voltages, fan performance while having the opportunity to record your favorite moments in-game and in real-time! 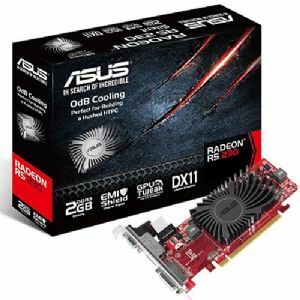 Purchase the Asus Radeon R5 230 Graphics Card today and game without fearing the heat!